The captial city of Zagreb, Croatia and the town of Litomerice, Czech Republic have something in common when it comes to planning for the future—they have asked their citizens! As case studies in the POCACITO project, these two exemplary cities have tested the participative approach, involving community members in the development of strategic planning documents. 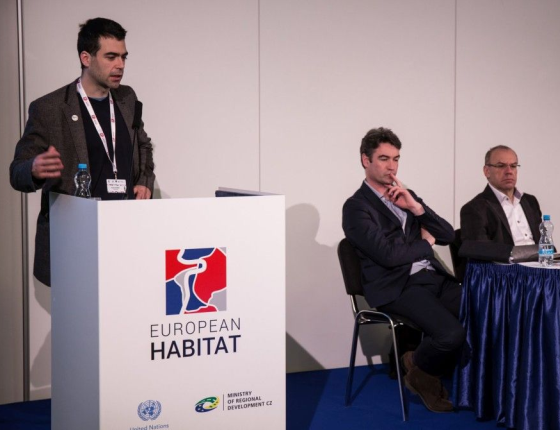 The side event, "Cities in motion of energy transition: How technology and data help urban development," at the 2016 European Habitat Conference in Prague introduced innovative projects on the use of data and technology to help cities deal with energy planning. Speakers at the side event presented initiatives that cities across EU have applied in moving towards a low-carbon future. These included tailor-made local solutions to fight energy poverty in poorer regions in Germany, energy advisor networks, small-scale energy efficiency measures and home energy checks. The POCACITO case study cities were highlighted as best practice examples of particapatory planning and citizen engagement in energy matters at a local level. Zoran Kordić, project partner from UNDP, gave a presentation titled, “Role of community initiatives and social innovations in transition to low-carbon urban development.” The talk was built on results from the POCACITO project. It focused on Zagreb as well as other Croatian towns and municipalities, pointing out success in local renewable energy cooperatives and other social innovations. Additionally, the presentation touched on crowdfunding as a viable financing option for such projects. With a New Urban Agenda for low-carbon transitions in the works, municipalities worldwide stand to learn from frontrunners such as Zagreb and Litomerice.